A number of organic Haritaki Plus users report that they have seen their cholesterol levels go down by using haritaki. One person in particular Jeff Williams from the Upland area of California reported that he did not alter any other aspect of his diet or exercise regeim for some months, and when he went to the doctor for a check up found that his levels had decreased to close to normal range. There is some research done in India that shows how haritaki does this. The research was done on rats, and the study is very detailed. In atherogenic diet induced hyperlipidemic model, the rats receiving treatment with Haritaki showed significant reduction in total cholesterol, triglycerides, total protein and elevation of high density lipoprotein cholesterol. Haritaki was found to possess significant hypolipidemic activity. 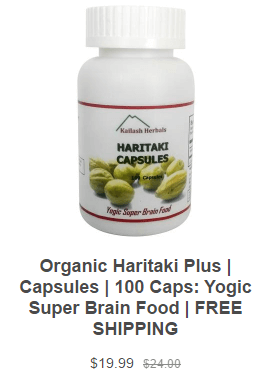 The results also suggest that Haritaki at 1.05 and 2.10 mg/kg b.wt. concentrations are an excellent lipid-lowering agent. How to take haritaki to reduce cholesterol? I recommend you follow the normal recommendation for haritaki, which is to take the haritaki, beginning in capsule form, in the evening after your evening meal. Take with a full glass of water for best effect. Take from 2 to 8 capsules. Haritaki lowers cholesterol by being a lipid reducing agent. The low-density lipoprotein: Cholesterol carried by this type of lipoprotein are essentially regarded as bad cholesterol. The high-density lipoprotein: Cholesterol carried out by this type of lipoprotein is what we know as ‘good cholesterol’. What are the causal factors of high cholesterol? High cholesterol has been found to be very unhealthy and a major risk factor for those with coronary heart disease –According to medical reports, it have caused quite a number of heart attacks. When the cholesterol builds up, it is noticed that the arteries pathway is narrowed –a process called ‘artherosclerosis’ and this in turn restricts the flow of blood. Cholesterol level can be reduced by a reduction in oil intake. Series of food sources can higher cholesterol levels such as –some meats, dairy products, animal food, cheese, fries and some processed foods. It has also been found that overweight (obese) people have higher tendencies of increasing the blood LDL levels. Genetics have also been seen to cause very high LDL levels which is unhealthy. There are also a number of other factors that can lead to cholesterol in humans which are mentioned below. Conditions that increase the female hormone levels such as pregnancy and some others. We are always on the lookout for signs and symptoms in most diseases in order to take preventive measures or quickly sort for help. As regards cholesterol and the symptoms when you have high cholesterol level, there are no clearly cut out symptoms –routine check-ups or screening of blood testing can help detect when high cholesterol levels are in the body of an individual. High cholesterol level can go unnoticed for years, silently killing the individual like a green snake beneath green grass. It is advised that routine checks should be done on the blood to examine the body in order to avoid high cholesterol level. Preventing high cholesterol is paramount for every individual so as to avoid the dangers of this condition. Doing things as basic as living a healthy lifestyle can help prevent high cholesterol level. Below are some of the practices to help prevent high cholesterol levels. Carrying out exercise on a regular basis –daily is okay. Smoking should be avoided as much as possible. Eating a very healthy diet for your heart. Always watch your weight as being obese can ignite high cholesterol levels. Take conscious steps in your day to day lifestyle and also adopt regular blood testing and check-ups in order to be free from high cholesterol levels. See a Doctor if you have the symptoms listed above.